Drain and rinse cannellini beans under cold water. Drain and set aside. In a large mixing bowl, whisk together white wine vinegar, lemon juice, grainy mustard, half of the herb blend, a pinch of red pepper flakes to taste, and 2 tbsp. (4 tbsp. for 4 servings) olive oil. Season to taste with salt. Wash and julienne basil leaves. Finely chop sun dried tomatoes. Add basil and sun dried tomatoes to the dressing, along with red onion and celery. Mix well. Heat 2 tbsp. (4 tbsp. for 4 servings) oil in large skillet over medium. Add shrimp and cook 1 minute per side. Add cannellini beans, garlic, remaining herb blend and remaining red pepper flakes to taste. Season with salt. Saute for 2-3 minutes or until cooked all the way through. Add beans and shrimp to the dressing and toss well. Season with salt and pepper to taste. 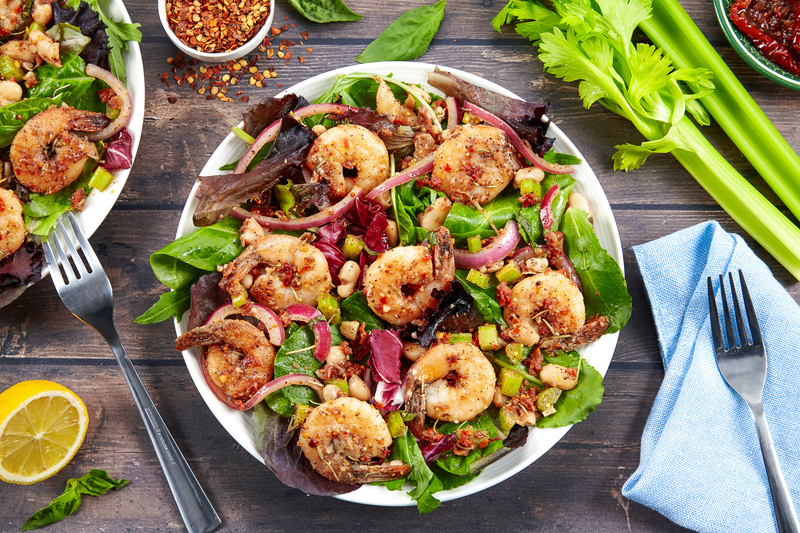 Divide lettuce mix onto plates and serve dressed shrimp and beans over top. Enjoy!